A great pint for a cool February day. Last year I brewed up two batches of cider – a traditional dry cider, and a cyser (mead-cider hybrid). The cyser is still clearing in secondary, but the dry cider itself is now on tap. This cider was, for me, somewhat experimental – I did not use pectinase to clear the cider, I used a different yeast than normal, and my post-fermentation plan was not my usual “stabilise and back-sweeten“. 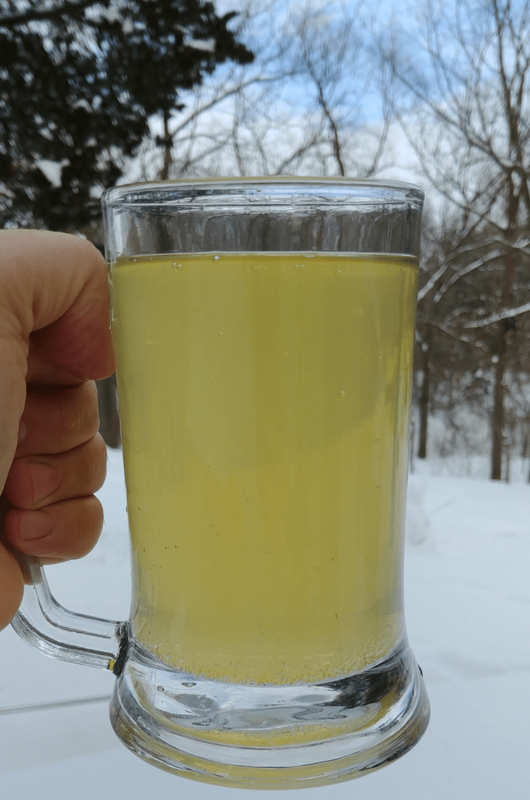 The changes to this years recipe and approach were motivated by a Brew Files episode where Denny discussed his preferred approach to making cider. I’ll briefly outline the differences below, and then move on to the usual formal tasting notes. I used WLP002 instead of Nottingham…I was actually intending to use Denny’s Favourite (Wyeast 1450), but due to a mis-labeled tube in my yeast bank I ended up with WLP002. I have no complaints; the ester character of WLP002 very nicely complements the apple character in the cider. I did not pre-treat with pectinase (pectic enzyme) to clear the cider, nor did I treat with metabisulfite to knock back the yeast. The lack of pectinase is obvious in the picture to the right – my cider is very cloudy. With more time this would clear, but I’m thirsty now, and my next batch will re-include pectinase. In contrast, there is no noticeable wild-yeast character, so I will forgo metabisulfite in the future. I did not stabilise and backsweeten. Instead, I adjusted the balance by adding 4 tsp of acid blend (by accident; I had planned on adding 2) and 1.5 tsp of wine tannin (based on the recommendation of this book). The effects of this were very positive, and I will likely do this instead of back-sweetening in the future. Appearance: Hazy pale yellow colour, pours with a high effervescence and a short-lived white head.The haze is not yeast or chill haze, and is likely a pectin haze – which is why I’ll use pectinase in future batches. Aroma: Intense apple aroma; probably the most apple-forward aroma I’ve had in a cider. The strong apple aroma has undertones of yeast and acidity that add additional complexity. Flavour: Upfront is an intense apple flavour alongside a strong acidity. The acidity is higher than I’d prefer – a direct result of accidentally adding double the acid blend I had intended. Although high, the acidity has the intended effect – it “brightens” the flavour, brings out more of the fruit character, and creates a crisper mouth-feel. The ester profile of the yeast (apple/pear) is complementary and subtle. Aftertaste is a lingering apple juice character. Mouthfeel: Wine tannin for the win! My ciders have always been a little thin in the mouthfeel department, and the wine tannin corrected that flaw. In place of thin & watery, I instead have a modest body that gives the cider a better “presence”. The cider is highly carbonated, which along with over-acidity, is strongly felt on the palate. Overall: Even with the mistakes I made, this is one of the best ciders I’ve brewed. The acid blend and tannin were the key to this years success, providing a better balance of flavour and mouthfeel than I’ve been able to achieve with back-sweetening. The cider is more acidic than I would prefer, but even so, acidic in a fashion which brings out its better characteristics. The approach used for this batch is definitely one I will use in the future – though-be-it, with pectinase to provide some clarity.